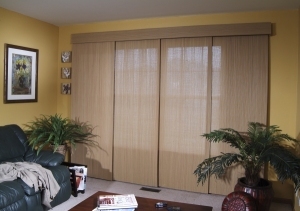 Élance ™ Sliding Panels are a fashionable way to cover large windows and doors. It offers smooth operation with a cord control. 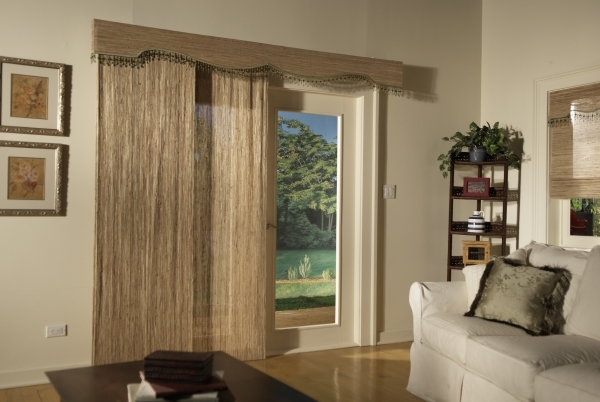 Élance ™ does not come standard with any valance. 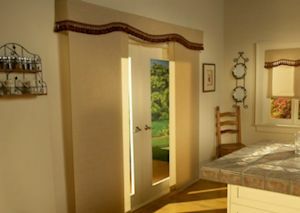 However, any of our valance or cornice options may be ordered separately. Download the COMPLETE product specifications/colors brochure! (.pdf) IMPORTANT! View ALL Shades of Elegance FABRIC samples! *Or the maximum width of the pattern -- whichever is less. 4 panel track: 3-5/8" 3-3/8"
6 panel track: N/A 3-5/8"
4 panel track: 2-3/4" 2-1/2"
6 panel track: N/A 1-3/4"
2 panel track: 3" 4"
3 panel track: 3" 4"
4 panel track: 3" 4"
5 panel track: 3-3/8" 4-1/8"
6 panel track: 3" 4"
The following chart shows how many panels an Élance will have for a given width. Please note that one-way and split-draw Élance often have different panel counts. The Stacking Space is the total width of the unit divided by the number of panels plus 2". For example: A 100" wide Élance ™ with 4 panels would have a stack of 27". Most patterns are available as Élance. Please check the Compatibility Chart. The factory will deduct 1/4" from the width of the track and 1/2" from the total height of the unit for an Inside Mount (IM). Important Note: The total fabric width will be 1" narrower than the width of the track. This will cause a 5/8 inch gap on the sides of an Inside Mount (IM) Élance ™. If this gapping is a concern, please consider an Outside Mount (OM). For an Élance ™, the 6" Classic Valance is attached to the front of the track with velcro. 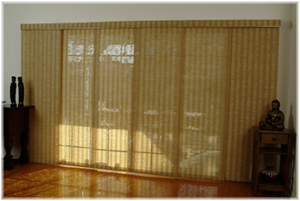 For Outside Mounts, valance returns are included at no extra charge. Inside Mount valances do not include valance returns unless requested. The pattern in the panels runs vertically. The pattern in the valance (if ordered) runs horizontally. 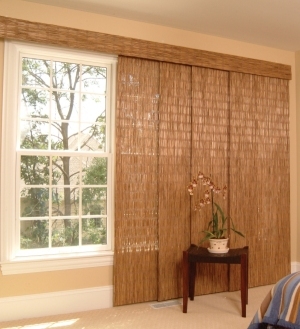 Classic Valances(sold separately) wider than the maximum width of the pattern will be split and butted together. An off-white Cord Guide is supplied to hold down the controls on all draw-cord Élance ™ Sliding Panels. This is in full compliance with the National Safety Council's standards.